200 Watt Transformer with Photo Cell and Timer. Enhance the beauty of any water garden and add intrigue with this Multi-Light Transformer with Photo Cell and Timer. Photo Cell and Timer will activate when it gets dark. Terminal Strip 12 Volt line connections accommodate any bare wire or "Y" connector application. 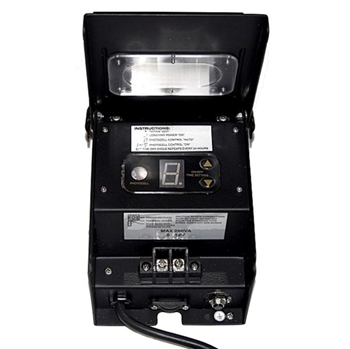 This unit should be connected to a UL listed Ground Fault Circuit Interrupter. Ground shielded for use with underwater lights.